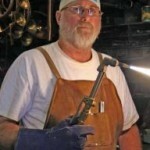 Joseph Farmer started welding nearly thirty years ago in the industrial sector, building and repairing machines. 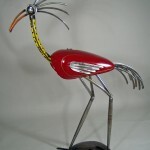 During his career as a welder-mechanic, he became influenced by the flexibility of the metalworking trade, not only as an industrial skill, but also as a medium to explore his creative moods. 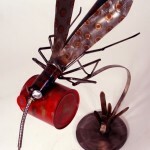 With scrap machine parts, Joseph began welding small abstract sculptures and plant stands. 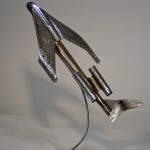 In 1977, Joseph studied the art of blacksmithing where he built his foundation for a serious endeavor into the metal-sculpture field. Learning the basics of blacksmithing allowed Joseph to understand how the “black metal” reacted to the influences of heat and force. 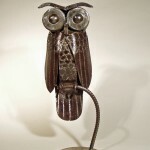 As an artist-blacksmith, Joseph combines his metalworking skills with junkyard / farmyard and found objects to create unusual sculptures in the shapes of birds, animals, insects, and other items. Sometimes the object itself defines what the work of art will become. The blade of a shovel becomes the back and neck of a bird and a large pair of pliers its head. 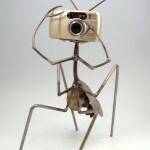 Or a desire to create a particular object will initiate a search for that right object to do the job. 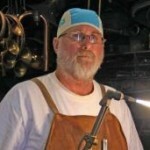 Joseph combs the area flea markets, garage sales, farm auctions, trash dumps and roadside ditches to obtain the components of his artwork. He has amassed a collection of material in his studio-garage. 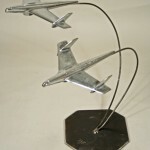 That along with the metal fabricating tools and equipment leaves just enough room to create his art.